Vodafone is offering 28 GBs of mobile data at Rs 348 while Reliance Jio's prepaid recharge plan of Rs 309 has the same offer. Vodafone, Relience Jio prepaid recharge plans are priced aggressively. Amid intense competition in the telecom market, Vodafone is offering 28 GBs (gigabytes) of mobile data for about a month at Rs 348. 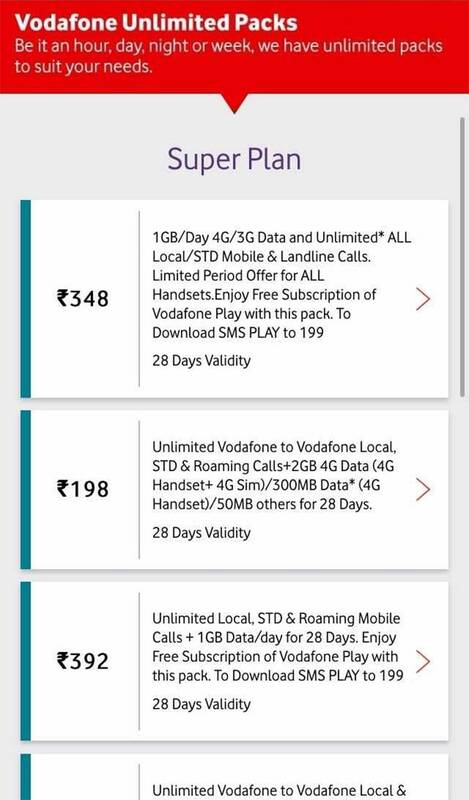 Under a special recharge pack priced at Rs 348, Vodafone India - the Indian arm of British telecom major Vodafone - offers 1 GB or gigabyte of 4G/3G speed data per day for a total validity period of 28 days. Vodafone's Rs 348 recharge pack also comes with the benefit of unlimited calls - local and STD alike. The Rs 348 recharge pack from Vodafone, among many other recharge options for its prepaid customers, comes at a time the Indian telecom industry is witnessing high competition due to free voice calling and aggressively priced mobile data from new entrant Reliance Jio. Customers are getting super-fast data in cheap prices as the Indian telecom sector has been going through a highly competitive phase. One after another, mobile phone operators have in the recent past rolled out attractive offers to counter aggressive mobile data offers by billionaire Mukesh Ambani-led Reliance Jio Infocomm, a new entrant in the telecom sector. Vodafone's recharge plan priced at Rs 348 comes with 1 GB of 4G/3G speed data per day for a validity period of 28 days, among other benefits, according to its website - vodafone.in. The Rs 348 recharge plan also offers unlimited local/STD calls made to mobile and landline connections. According to Vodafone's mobile app, called 'My Vodafone', this is a limited-period offer available for all handsets. Customers also get free subscription of Vodafone PLAY, an app which streams TV channels and movies. Under this recharge pack, customers get 1 GB data per day for a validity period of 28 days, among other benefits. Vodafone's Rs 392 pack also comes with unlimited local, STD and roaming mobile calls. 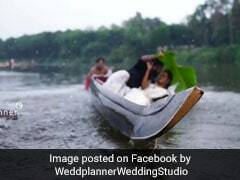 Customers also get free subscription of Vodafone PLAY. Jio's recharge pack priced at Rs 309 comes with a validity period of 49 days and 1 GB of mobile data per day for that period. After usage of 1GB data per day, the speed is reduced to 64 Kbps, according to the Jio website - jio.com. The maximum data that can be availed under Jio's Re 309 prepaid plan is 49 GB. Voice calls and SMS are unlimited, Jio said. Local, STD and roaming calls to all operators are unlimited and free and so are the SMSes, it added. 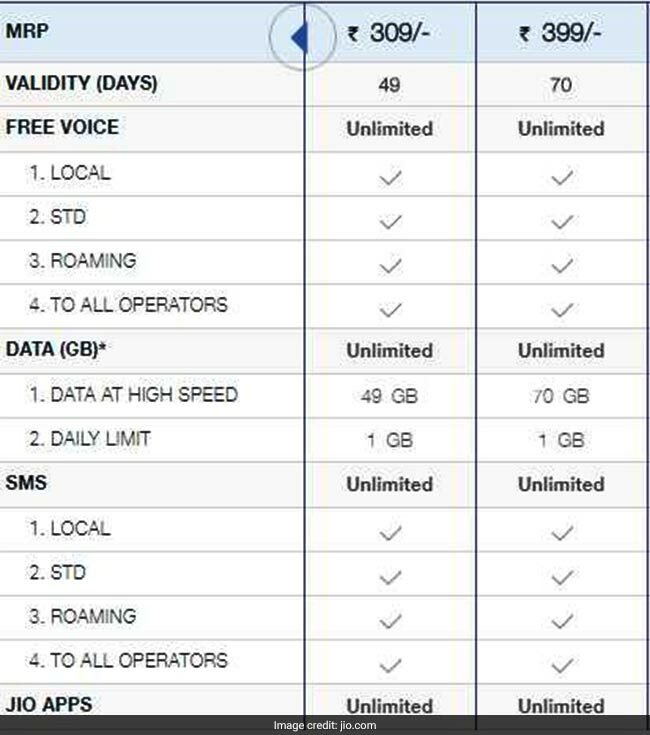 Jio's Rs 399 recharge pack comes with a validity of 70 days. Under its Rs 399 recharge plan, Jio offers 70 GBs of high speed data with a daily limit of 1 GB for the validity period, among other benefits. 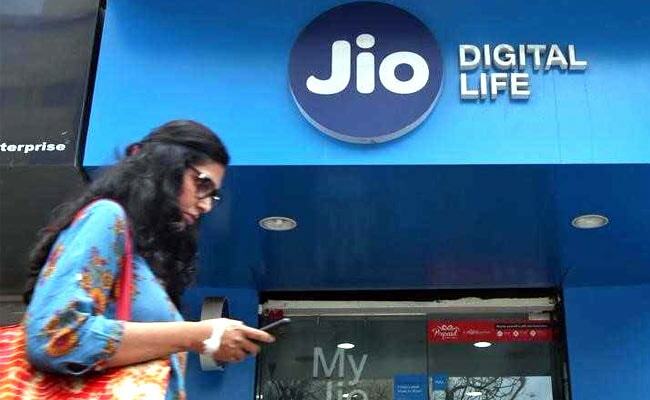 Like many other prepaid packs offered by Jio, the data speed is reduced to 64 Kbps after the customer exhausts the daily limit, according to the Jio website. Local, STD and roaming calls and SMSes to all operators are unlimited and free in the Rs 399 prepaid pack.